A sweet, eclectic little old man passed away on March 14th and his name was Jim. 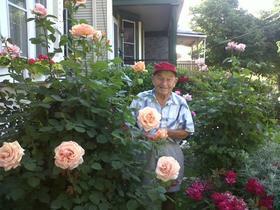 Jim spent his life serving his country in the Navy, tending roses, loving his late wife Audrey and working very hard. His family and friends may have been few but if you were accepted into his inner circle you were very blessed. He was a great story teller, antique collector extraordinaire, and animal lover. If you crossed his path in the Brady Street neighborhood while walking your dog I'm sure you will remember sweet little Jim. After suffering a stroke he finally found peace and is happily in heaven tending rose gardens, sharing a cocktail with his beloved Audrey and enjoying his animal family. His furkids included Bijoux, Georgette, Nick, Leroy, Olivia, Beauty and many, many more. He is survived by his dogs Marigold and Seamus and his sweet cat John, all of whom have been blessed to find loving homes. Jim, you were truly cherished and will be missed. If you would like to memorialize Jim, please donate to the Wisconsin Humane Society or Milwaukee Area Animal Control in his name, or plant a rose bush in his memory.